If you are looking to invest in a Maytag chest freezer, you'll be pleased to hear that there is a single model on offer. So you can save yourself the torment of being torn between 2 chest freezer models. Even though the Maytag MQC1552TEW is a loner in the Maytag world, its 14.8 cu. ft. capacity, robust design, security lock and Energy Star qualification mean that it shines brightly in the chest freezer world. Folks, how many times have you read customer reviews about freezers that ended up cooking the food they were supposed to freeze? Probably quite a few times. Well, this Maytag freezer is different. This is because coils grace all 5 sides of the freezer, as well as the bottom. Coils also wrap around the corners, effectively eliminating warm zones and ensuring that your food remains frozen rock solid. It measures 46-1/8" W x 24-3/8" D x 34-6/8" H, making it a great addition to a mid-size kitchen, garage or basement. Just be sure that this freezer will fit in its designated spot. So go ahead and grab your measuring tape. Does The Maytag Chest Freezer Have Sufficient Capacity? Well, obviously it depends on your individual needs. But the Maytag chest freezer has a capacity of 14.8. cu. ft. If you are a medium sized family, this freezer provides room for you to stock up on family favorites when they are on sale. Obviously with any chest freezer that is larger than a compact, there is always the risk of food wading to the bottom and lying forgotten there. Thankfully the guys at Maytag anticipated this problem and crafted a solution for it. They included 2 large storage baskets that make food organization a breeze. This chest freezer has a mechanical temperature control. This is an excellent option if you find maneuvering digital controls nerve-racking. Dial the thermostat to the extreme left and you have the coldest setting just as you would have back in the day. This Maytag chest freezer requires to be manually defrosted every so often, but sigh not. The built-in defrost drain makes it easy to channel thawing water out of the freezer for disposal. That way, you don't have to mop up a mess afterwards. If security ranks high on your list of criteria for an ideal chest freezer, you're in luck. The Maytag MQC1552TEW doesn't come with an ordinary key; it is a pop-out key. So, when you lock the freezer, the key automatically pops out with a click, helping you to remember to put it safely away. It isn't a flimsy lock so that when you lock you have to hover around, just in case someone breaches the freezer's security. In this case, you can lock and leave home with the assurance that when you get back home, your food will be just where you left it. That it didn't grow legs while you were away. 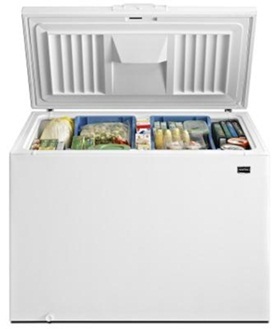 This Maytag chest freezer model consumes just 354 kWh of energy each year. That costs just $3.17 to operate each month. So this chest freezer model is an energy saver which in turn saves you money via a lower electric bill. It carries the coveted Energy Star label, which is really a sophisticated way of saying it exceeds federal energy efficiency standards. Quite a feat, if you ask me. After all, we shop with our eyes first. And there's plenty to feast your eyes on. It's white, which is a great choice if you love a kitchen with a clean look and feel. And its integrated handle delivers a sleek, modern appearance. 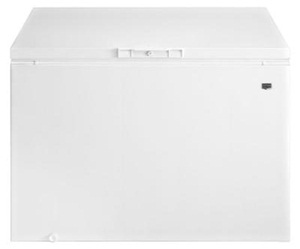 The Maytag chest freezer also sports a robust, solid lid that can support over 200 lbs. without denting. Plus, it won't spring closed on you when you are adding or removing items to the freezer. 14.8 cu. ft. capacity, certified energy efficiency, and a lock with pop out key. And a 1-year warranty assures you that the freezer won't go dead on you as soon as you bring it home and that if it does, Maytag will fix defective parts and workmanship that existed at the time of purchase. It's a Maytag chest freezer lone star but is proof that there are instances when one is better than more. Click here to bring this star home, today.